Vajrakilaya (Skt. Vajrakīlaya; Tib. རྡོ་རྗེ་ཕུར་པ་, Dorje Phurba, Wyl. rdo rje phur pa) or Vajrakumara (Skt. Vajrakumāra; Tib. རྡོ་རྗེ་གཞོན་ནུ་, Dorje Shönnu; Wyl. rdo rje gzhon nu) — the wrathful heruka Vajrakilaya is the yidam deity who embodies the enlightened activity of all the buddhas and whose practice is famous for being the most powerful for removing obstacles, destroying the forces hostile to compassion and purifying the spiritual pollution so prevalent in this age. 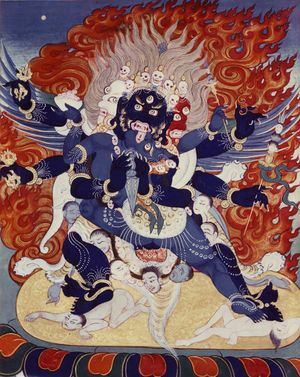 Vajrakilaya is one of the eight deities of Kagyé. English translation: Fragment of the Vajrakīla Root Tantra, translated by Martin J. Boord, in A Bolt of Lightning From The Blue (Berlin: edition khordong, 2002), pages 79-90. Colophon: This fragment of the root tantra of Vajrakīla was translated [into Tibetan] by the illustrious Sakya Pandita in accordance with an original Indian manuscript that had actually belonged to the ācārya Padmasambhava. Requests having been made, it was set down in writing in Shangs Sreg-zhing in the district of gYas-ru (eastern Tsang). Accomplishment of the Supreme Activity: A Method for Reciting the Fragment of the Vajrakīla Root Tantra (Wyl. phur ba rtsa dum rgyud kyi bklags thabs phrin las mchog grub), by Jamyang Khyentse Chökyi Lodrö. English translation: Supreme Siddhi Activities, A companion manual for reading the Fragment of the Vajrakilaya Root Tantra, translated by Gyurme Avertin, 2018. 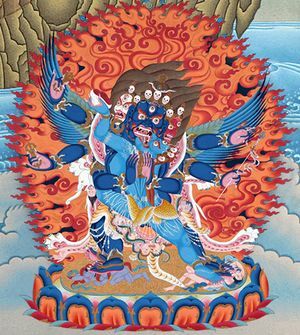 The Longchen Nyingtik practice of Vajrakilaya related to the Palchen Düpa is called "Overpowering the Forces Of Mara" (phur pa bdud dpung zil gnon). Yang Nying Pudri, The Razor of the Innermost Essence, a terma of Tertön Sogyal. This is the main yidam practice of the Rigpa sangha. This was written by Dudjom Rinpoche as a short daily practice related to the terma cycle of Pudri Rekpung, The Razor That Destroys at a Touch. The “Wisdom Mind Practice of ‘One Phurba’” is a terma discovered and deciphered by Tertön Sogyal in the monastery of Kathok Dorjé Den. It was written in the hand of the great Dzogchen master Vairotsana. Short Meditation Practice of Vajrakilaya by Jamyang Khyentse Chökyi Lodrö. This short sadhana was composed by Jamyang Khyentse, at Sogyal Rinpoche’s request, while travelling on horseback from Kham (East Tibet) to Lhasa. Martin Boord, A Bolt of Lightning from the Blue—The Vast Commentary on Vajrakila that Clearly Defines the Essential Points (Berlin: Edition Khordong, 2002), which contains the translation of two short tantras of Vajrakila and a full translation of the most important commentary ever written (Wyl. phur ‘grel ‘bum nag) on the subject of kila rites and their understanding for enlightenment by Padmasambhava, Vimalamitra, and Silamanju. This page was last edited on 22 July 2018, at 11:49.